What this particular form has in common with most bottles with a protruding foot is that the foot is broader on the main profile than the neck, while being narrower from the narrow-side view. This greater width in one direction gives it greater stability and it is also important visually. From the main view of a compressed or flattened form, even if the body itself is not tapered, the larger foot gives the impression of a taper, accentuated here by the rounding of the shoulders, which is greater than the base area leading into the foot. This adds visual sturdiness to functional sturdiness. It also adds a touch of elegance. In this case, it is particularly suitable as a form, since the black tourmaline crystals are concentrated more heavily around the foot, accentuating the tapering effect on one main side. Another intriguing aspect of this form is that if you take the area of maximum width and visualize it as a band, as in a banded agate for instance, it is placed just below the centre line. Together with the greater concentration of the needles in the lower part of the bottle, this form serves to give a lower centre of gravity to the bottle, which visually balances the prominent detail of the stopper and makes the form more confident and sturdy. There is also an unusual feature of the narrow side profile in this example: it tapers towards the foot, giving the opposite impression visually to the main-side profile. Again, however, banality of form is avoided by placing the maximum width in a band above the centre line in the same way as it is below the centre line in the main profile. This also serves as a balance, although a different one, for the visual weight of the stopper. This is a typical example where, so as not to lose the beauty of the material, which, after all, lies in the inclusions in the walls of the bottle, the hollowing has left a substantial thickness of wall. 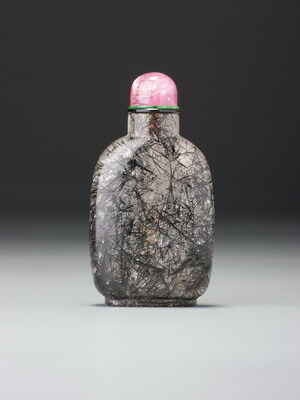 This is one typical way of hollowing crystal bottles, where a greater depth of wall created a brilliance of material that was valued and, in this case, allowed for more internal markings. The only criticism one could level at the hollowing is in the finishing. The fan-shaped markings of the initial, annular drilling to create space in which to work are still visible, although mostly polished out, whereas the perfectionist would have removed them. It is such markings that allowed us to figure out how bottles were hollowed in the first place. 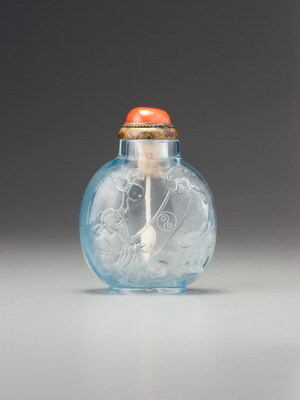 It is likely that this common feature on certain crystal bottles, several of which are of this form and in hair-crystal, may be from the same workshop and represent a school style. There is a point worth making about the stopper here. As a rule, doubled collars rarely work successfully, unless they are of the same colour and used to create a specific profile of collar, or a greater depth. With the extensively used vinyl collars of recent decades, it is sometimes useful to be able to step the collar by using two different sized discs or, to double its depth, two of the same size. Using collars of two different colours or materials is rarely successful, however, since it looks a bit pretentious. It works here only because the two are so thin that together they make up the thickness of a single collar, and because the black can be read almost as a line defining the upper limits of the black tourmaline needles. It might have been better to omit the green collar, however, since the two raise the stopper, which is already a tall one, to a slightly uncomfortable height. The formal balance between stopper and bottle is crucial, and if one overpowers the other it is lost. It is eventually, like so much in aesthetics, a matter of personal taste but there are certain canons that are sensibly applied, even if they can never be absolute.